so... i've been working on a project the past couple of days. a project completely inspired by a sit-down family meeting we had recently. a meeting to discuss/review some family values/rules. we talked about having the girls make a poster of the words we came up with. "let's turn this into a permanent fixture in our home..."
still fine-tuning some things but pretty cute, huh? i'll definitely share once i have it mounted & displayed. 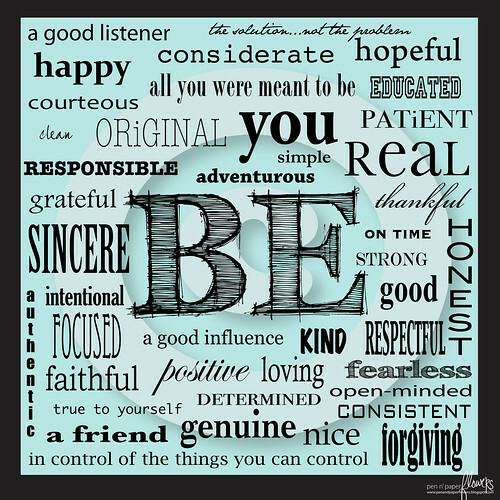 what are some of the "words to live by" in your household? pssst....start making a list of your own! I LOVE THIS! What a fantastic idea! I think my hubsy and I may have to do this and display it in our home. Fabulous! This is soooo neat. This is such a wonderful and creative way to share family time together. I love it. Thanks for sharing, Jess! Amy - I'm finding out...just as you said...the canvas is WAY expensive. I'm looking at $55 for a 10x10. YIKES! I tried looking into Costco's pricing for canvas but since I'm not a member..shame on me...the only thing I've been able to find is that the prices start at $29. I'm not sure what sizes they offer. I'm looking into some alternative printing options right now. (ie. adding texture to the print, etc.) I'll definitely be posting my findings. Thanks for getting back to me so fast! I never even thought of Costco offering canvas printing. I am a member and looked on their site, here is what they offer, sizes & prices: "Turn your favorite photos into art with these stunning, professional quality canvas prints. Mix and match sizes to create your own family photo wall or give as an unforgettable gift for any occasion. thanks so much for the breakdown on the pricing from costco...LOVE that you sent this to me. can't wait to see the finished product...i'll share. Jess, this is so creative, so you:) I love it! I would hang it up in my kitchen, that is where we are the most and could be reminded on a daily basis. If I were to add to it I would add BE open to possibilities!